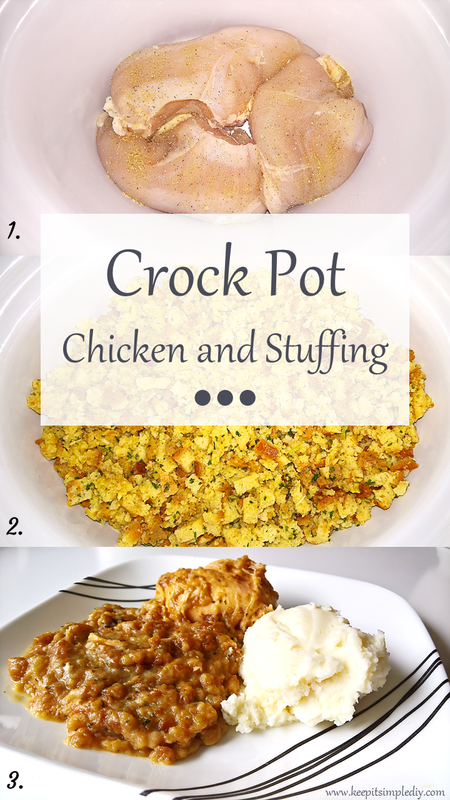 This crock pot chicken and stuffing recipe has been my go to meal for the last few months. I originally saw the idea on Pinterest and noticed there were quite a few variations. This recipe is super simple and great for the winter! Also with Thanksgiving this week, adding turkey instead of chicken can make a quick Thanksgiving meal! I line the bottom of my crock pot with thawed chicken breasts (usually 3) then season as desired. I then pour one can of condensed soup over the chicken. This can be cream of chicken or any other creamy soup. Next, I prep the stuffing. In the images above I added 2 cups of water with chicken bullion in it to the boxed stuffing mix. I’ve since adjusted the recipe to only one cup of water without any extra flavoring. The first go around was a bit too salty and the stuffing was more watery than I desire. Feel free to adjust the water until the stuffing comes out just how you like it! Once the water is all absorbed into the stuffing mix, I dump the stuffing into the crock pot so it evenly covers the chicken. I’ve gone back and forth about adding the potatoes into the crock pot or making them separate. I’ve been using instant potatoes which are super quick to just boil some water in the microwave then mix. In the pictures above, I kept the potatoes separate but recently I’ve been adding them to the pot. It turns about about the same either way. I love anything i can make in the slow cooker! This is super easy and I might try using regular potato instead of the instant. Could’t do without my crock pot. I love using the crockpot…always amazing to have a nice meal like this ready when you get home…yum! It is getting cooler here in the Phoenix area and I have been thinking about cooking something a little more hardy. This looks like the perfect dish to try when I have family over for the Thanksgiving holidays. Making quick yet wholesome dinners like this is definitely the way to go for me with three kids and two jobs 🙂 Yummy! This really look so good. I have been into crock pot cooking nowadays. This is such a great find. I can’t wait to try it. This looks really great! I love how you’ve used boxed stuffing mix! Can’t wait to try this! This looks so good. I love a crockpot meal because it makes my day a little simpler.